"This is a picture that I took of our dog Desi. 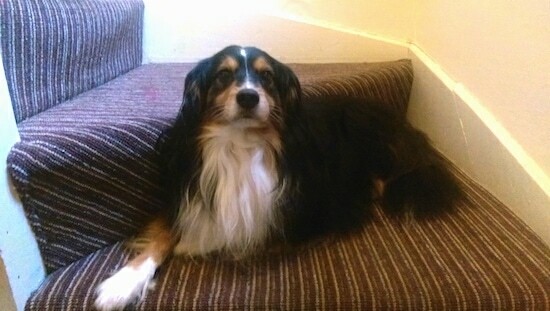 Desi is a hybrid—Cavalier King Charles Spaniel and Sheltie mix (Cava-Shell). She is a little over 1 year old in this picture and is a wonderful dog. She is very compliant, a quick learner and very well-behaved. She is very loyal and loves to cuddle! She is shy and timid at first when new people are introduced. She has never even attempted to snap at any other person or animal, and does not seem to have a mean bone in her body. She loves children once she gets past her shy stage. She absolutely loves the outdoors, swimming and playing fetch. She loves to exercise. Her fur is pretty low maintenance. We did notice shedding of her undercoat during the transition from winter to spring. Frequent brushing helps with that." The Cava-Shell is not a purebred dog. 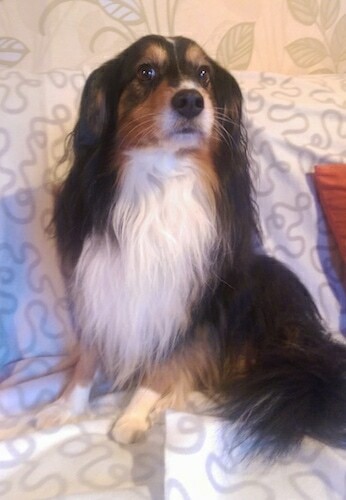 It is a cross between the Cavalier King Charles Spaniel and the Sheltie. The best way to determine the temperament of a mixed breed is to look up all breeds in the cross and know you can get any combination of any of the characteristics found in either breed. Not all of these designer hybrid dogs being bred are 50% purebred to 50% purebred. It is very common for breeders to breed multi-generation crosses. Hoby the Cava-Shell at 7 years old—"I bought Hoby in Letterkenny Ireland. He is a very friendly and smart dog. He also has been very healthy. I never had any problems with him." 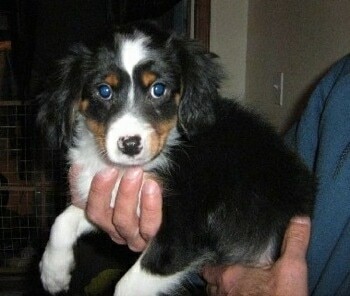 "This puppy is a cross between a King Cavalier and a Shetland. He has an even temperament. Playful little guy."